It is advisable to backup the Decisions Database	before updating. 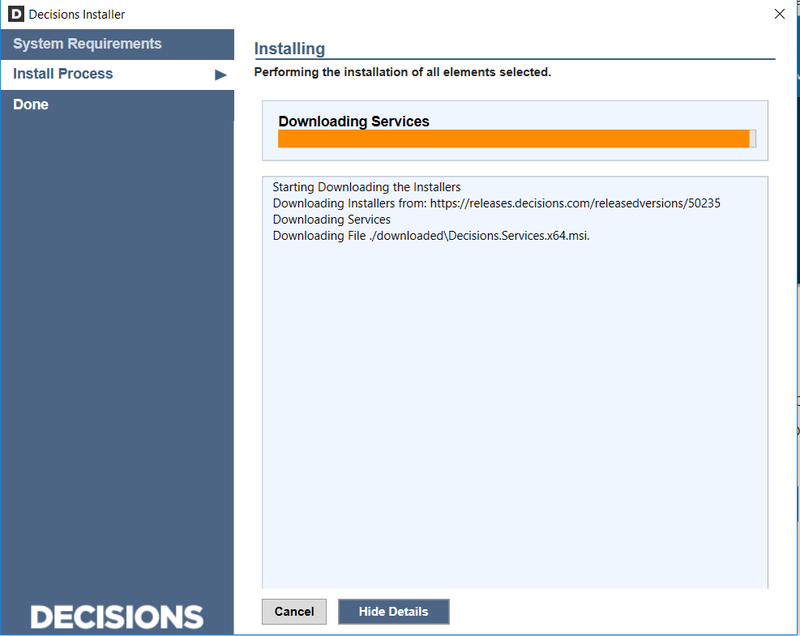 To update the Decisions software to the newest version start by downloading the Installer	again. 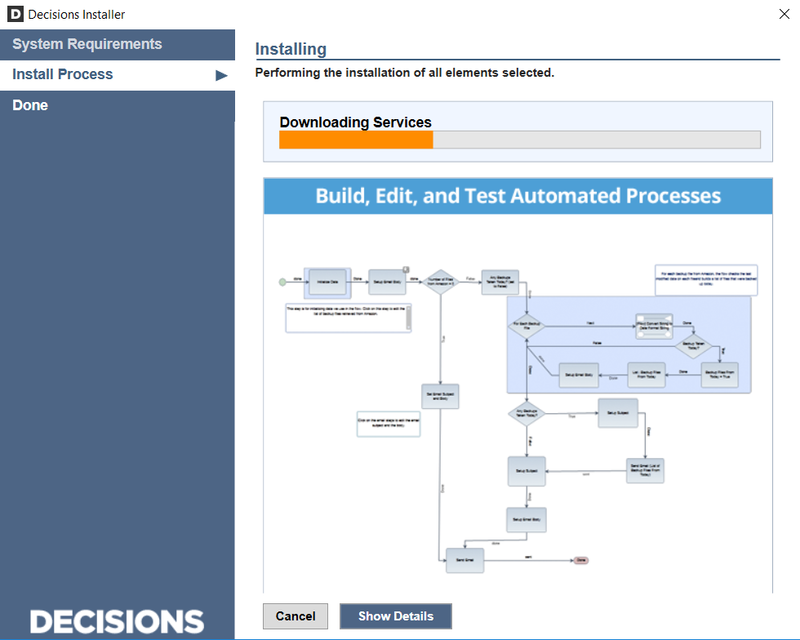 Begin by navigating to releases.decisions.com in the web browser. 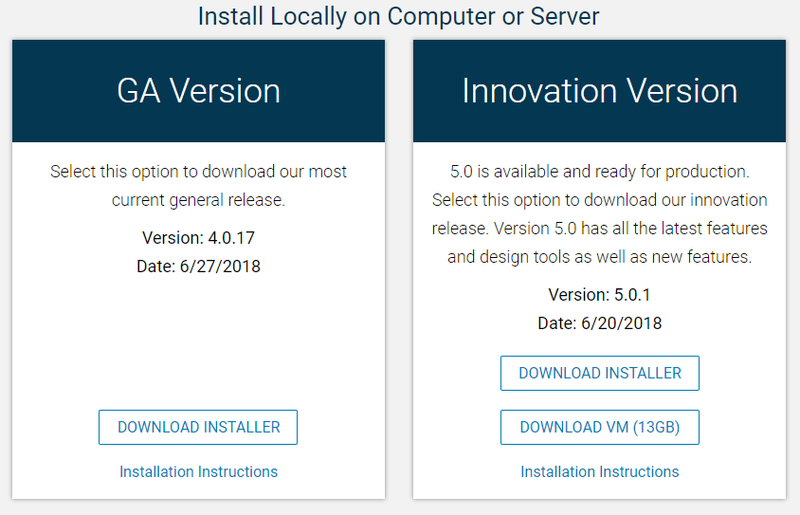 Select on Install	under the version you would like to install. This will bring up the Releases	page. Select the version you would like to update. Select Save File	on the resulting .exe file. This should bring up the Decisions Installer. Select Update	to continue. You can check the Change Setting on Update	box to modify settings before the Update. 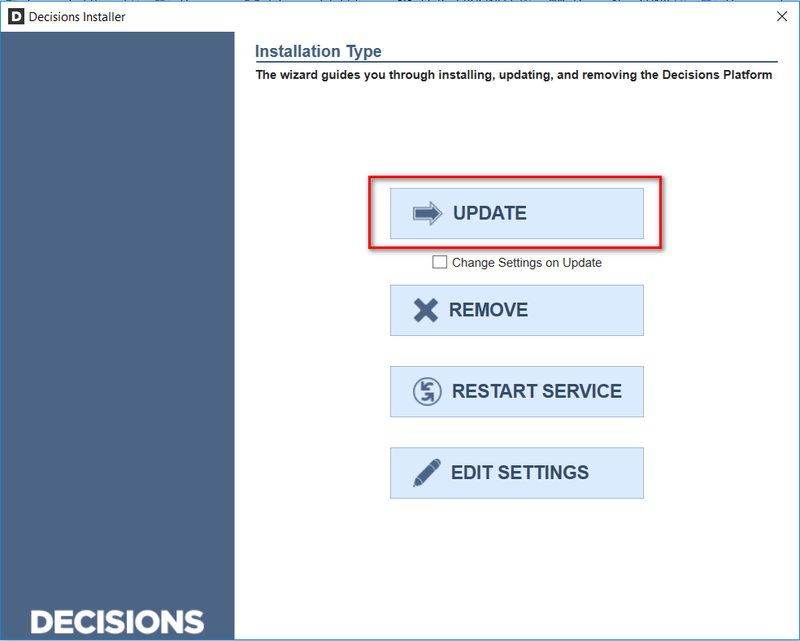 Otherwise the Updater will use the same settings that were entered on the last Decisions Installation. 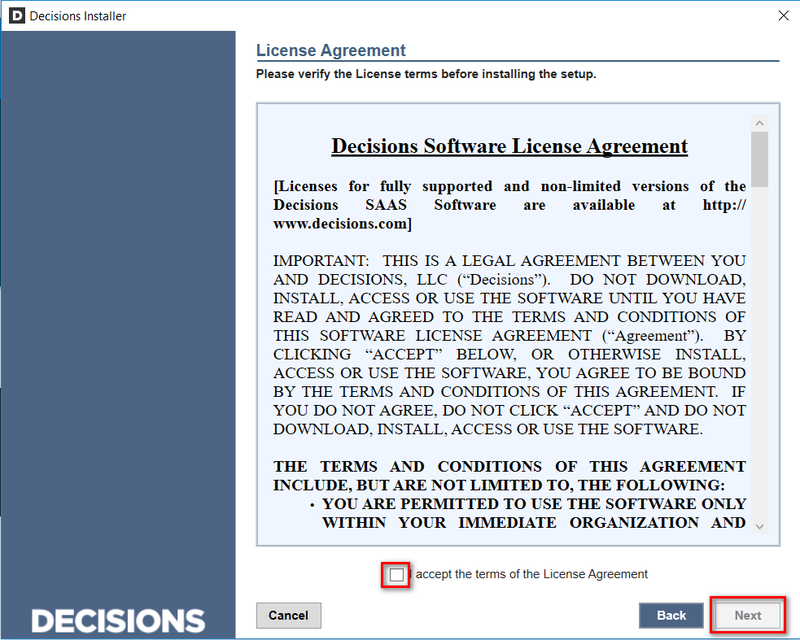 After reading the License Agreement check the "I agree to the terms of the License Agreement" box and select Next. If the change settings box was checked these options will appear. Install Emergency Password Reset Tool	– If selected, the installation will include an Emergency Password Reset Tool, which is a process that resets a user’s password when their account is locked out. Pick Alternate Source	– Enables either a URL or directory to select for the installer files. Install Image Library	– Enabling this setting installs the image library of icons available for use (which can be used as icons for items posted to the Service Catalog, for example, or to represent published workflows). Images are installed to C:\Program Files\Decisions\images by default. Show Service Settings	– Enabling this setting makes it possible to customize the user name/password under which the Service Host Manager Service will run. Run Service Host Manager Watcher after Installation	– If enabled, the Service Host Manager Watcher service will run after installation. This is the process that can start and stop the ‘Service Host Manager’ that the Portal depends upon, as well as watches and restarts it if it stops for any reason. Skip DB Connection Testing (Not Recommended)	– If checked the Database Connection Testing will be bypassed. Select the settings desired and click Next	. 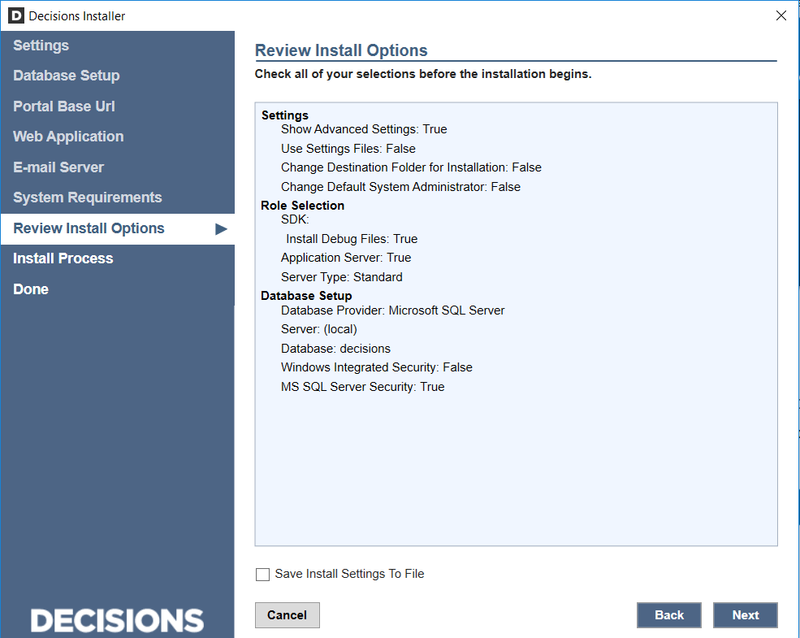 Select any changes to the Database Setup	settings desired and click Next	. Select Next	to retain the same settings. Select Next	on Portal Base URL	to retain the same URL. Select Next	on Web Application	to retain the same settings. Select Next	on Outbound Email Server	settings to continue. Finally, the installer will automatically perform tests of the installation environment to ensure that it meets the operational requirements to run Decisions. 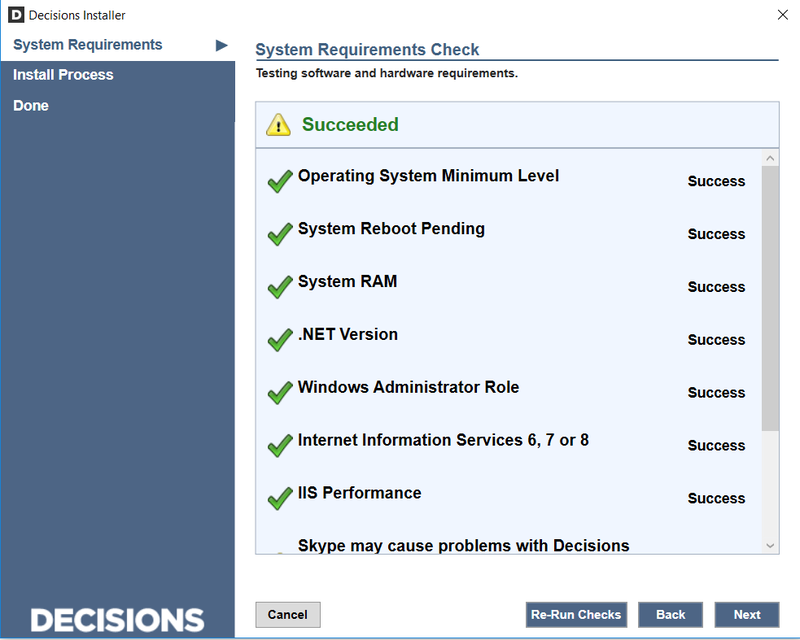 When all of the system requirement checks have successfully completed, Select the Next	button. 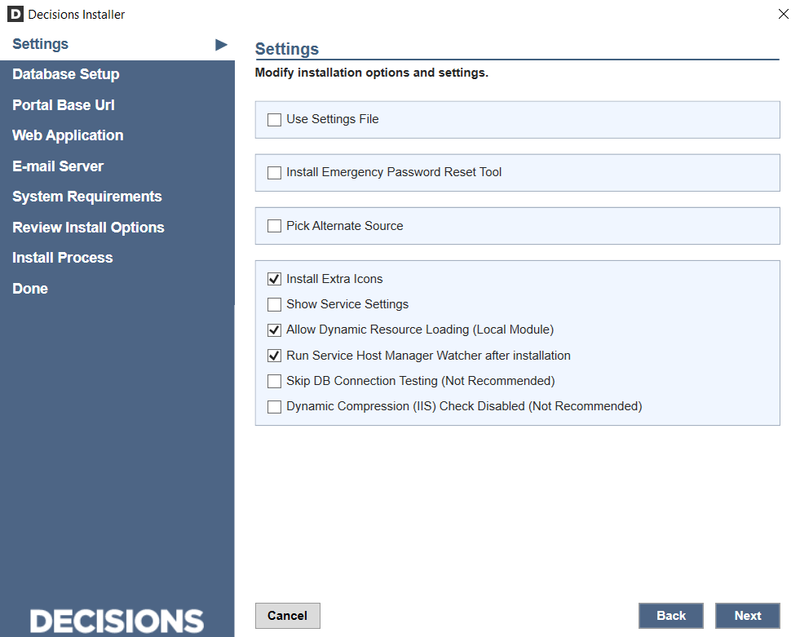 The installer will list the configuration settings for this installation. To save these installation settings for future reference – such as in the event a re-installation or recovery – select the Save Installation Settings to File	checkbox. Click the Next	button. The installer will begin updating Decisions. A progress bar will appear. Select Show Details	to see a report of whats happening behind the scenes. When the installation is complete a message will appear. 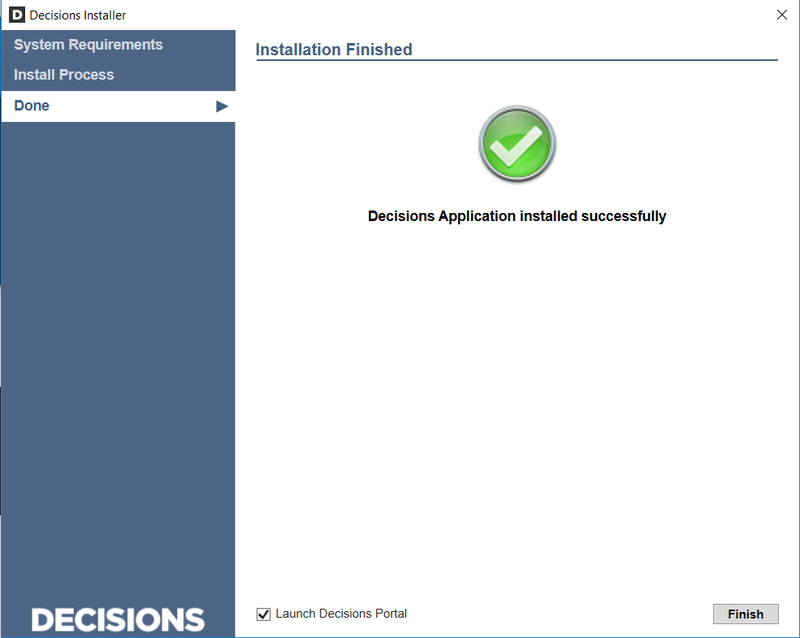 Select Finish	to close the installer and launch Decisions Portal.